One of Apple’s (NASDAQ:AAPL) bright spots for 2018 was the Apple Watch. The smartwatch continues to lead the industry in sales, and saw significant growth in 2018. With the release of the Series 4 in September, AAPL introduced advanced health features, and that move is showing signs of paying off in a big way. The company is reportedly in talks with private Medicare plans about subsidizing the Apple Watch for seniors. 2019 may be starting off on a rough note when it comes to iPhone sales, but as it approaches its fourth birthday, the Apple Watch is poised to contribute a bigger share to AAPL revenue — without depending on consumers to open their wallets. CNBC reports that Apple is in talks with at least three private Medicare plans about providing a subsidized Apple Watch to members over age 65. 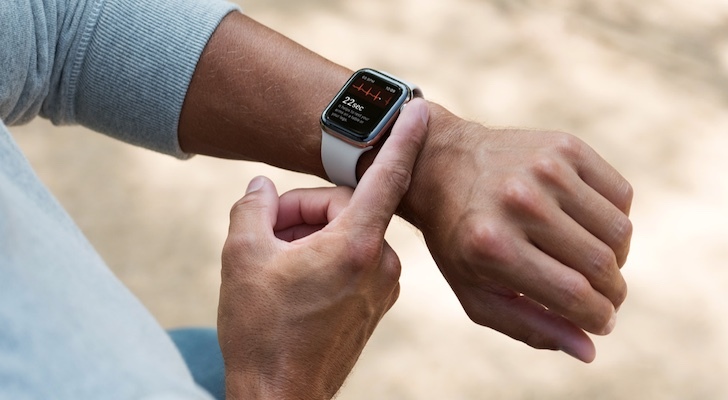 Introduced last September, the Apple Watch Series 4 (read our review here) incorporates advanced new health features, including a built-in ECG test and fall detection. The Apple Watch competes with smartwatches like those from Fitbit (NYSE:FIT), which offer health features like heart rate tracking, but lack the capabilities AAPL introduced in the fall. According to CNBC, there are currently about 19 million seniors enrolled in a Medicare Advantage plan. That’s notable because this tier of plans receives government payouts averaging $10,000 per member, giving more flexibility for the plan providers to invest in new preventative technology. AAPL is making the case for some of that cash to go toward purchasing an Apple Watch. How would the economics of giving an Apple Watch to a member work in favor of the insurers? After all, an Apple Watch Series 4 starts at $399. The 2017 Series 3 — which still has many health features but lacks ECG and fall detection– goes for $279 and up. That is a significant investment. CNBC quoted the CEO of Medicare Advantage plan provider Bright Health, who said, “Avoiding one emergency room visit would more than pay for the device.” In addition, if AAPL can show that the Apple Watch could help Medicare members detect potentially serious health problems before they reach the stage where a costly medical intervention is required, insurers would count that as a big win. When the Apple Watch first launched in 2015, it failed to meet lofty sales expectations. The device dominated the fledgling smartwatch market, but lacked mass market appeal. AAPL quickly pivoted and began to reposition its smartwatch for the fitness crowd with positive results. In 2018, the company continued to push fitness capabilities, but added a focus on health to the mix with the Apple Watch Series 4. In Q3 2018, AAPL saw 54% growth in sales for its smartwatch. Apple has already been successful in convincing other health industry companies to provide subsidized Apple Watches. For example, CNBC points to a 2017 deal with life insurance company John Hancock that provided an Apple Watch for $25 to members of its Vitality plan who committed to exercising regularly for two years. At a time when the company — and Apple stock — is feeling the effect of declining demand for its bread and butter iPhone, the Apple Watch has potential. And if AAPL is successful in tapping the health market, Apple Watch sales could explode far beyond consumer levels. Article printed from InvestorPlace Media, https://investorplace.com/2019/01/apple-talking-to-medicare-about-apple-watch-for-seniors/.